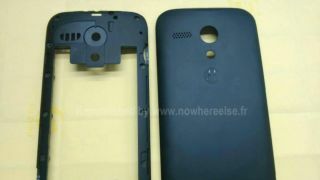 Just hours after the the leaks of the Moto X's back and front panels, more pictures of the customisable handset have revealed themselves online. Put together with the pictures we saw from the weekend, the new images, leaked on Weibo and passed onto Nowhereelse, help paint a better picture of the handset - assuming that they're real, of course. For one, they give us a clear look at the rear of the casing on the black handset that looks set to come in a matte finish, while we're expecting the front to have a nice glossy touch. The white case, on the other hand, has a textured finish to its back. While we can only see the black and white variants right now, Motorola is expected to offer the phone in a large spectrum of colours. After all, what's a customisable phone if you can't choose your hue? However, it turns out that the guessed July 11 unveiling is a definite no-no. Android Community has been informed directly that no such event will be taking place, and the fact that the two people in the advert are posed like XI - the Roman numerals for 11 - is nothing more coincidence. Unfortunately we won't be able to customise the handset's specs. Leaks have suggested that the phone will have a 1.7GHz dual core MSM8960 Pro chip, 2GB of RAM, a 720p display, 16GB of storage, a 10-megapixel camera on the rear, and a 2-megapixel on the front. Guy Kawasaki, advisor to Motorola, recently suggests that you'll be able to customise the Moto X as if it were a classic Porsche, and we expect the phone will be available in a large range of possible colours.